Business Insider Top 100 List! The challenge of life is to create and sustain excellence in health, relationships, and work. As Director of Behavioral Sciences for the Family Practice Residency Program at Santa Monica UCLA Medical Center and a faculty member with the UCLA School of Medicine, Dr. Maurer has traveled extensively, presenting seminars and consultations on a broad spectrum of issues that face people and organizations today. Dr. Maurer has appeared on ABC/TV's "20/20" in connection with his work on conflict resolution. USA TODAY recently featured his new best-seller, One Small Step Can Change Your Life: Using the Japanese Technique of Kaizen to Achieve Lasting Success. And a recent Los Angeles Times profile highlighted Dr. Maurer's seminars on creativity. 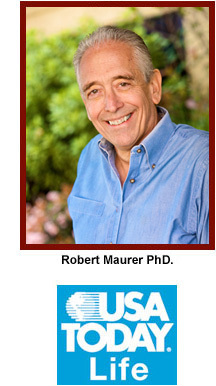 The impact of Dr. Maurer's unique approach to personal happiness and success is reinforced by his commitment to scientific research. His presentations on success have reached audiences as diverse as corporations, hospital patients and staff, theatrical companies, and the British government. Thus, his work as a clinical psychologist has resulted in the development of an extensive series of programs designed to meet the challenges of building and sustaining our excellence and well-being. So when looking for an effective translator of a new psychology of success, experience the impact of Dr. Maurer's unique approach to personal happiness and success. • Lectures, seminars, and workshops fees are negotiable. • Corporate and individual consultations are available. Copyright ©2017 - Science of Excellence by Robert Maurer PhD.